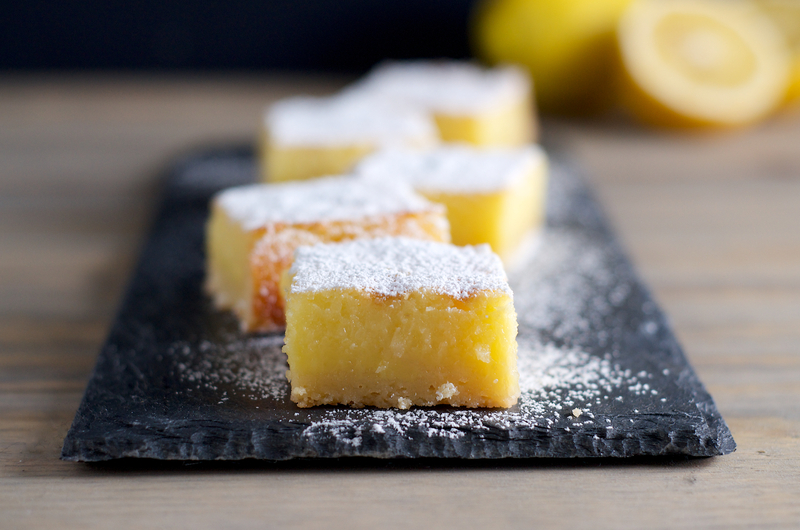 These lemon bars were so awesome and incredibly easy. There’s no zesting or juicing, you use the whole lemon, and the bars are just bursting with lemon flavor. A lot of lemon desserts overcompensate for the tart, and overly sweet for our liking. I thought these bars however, are perfectly balanced with sweet to tart. These bars were so good, Mike requested another batch right after we finished the first one. I have yet to oblige him with all the awesome stone fruit available this time of year. Too many desserts, too little time. But I’ll definitely be making these again some time soon. Recipe can easily be doubled and made in a 9 x 13-inch pan. Place rack in middle of oven and preheat oven to 350-degrees. Cut two 12-inch lengths of parchment paper, and trim to fit the bottom of an 8-inch square baking pan. 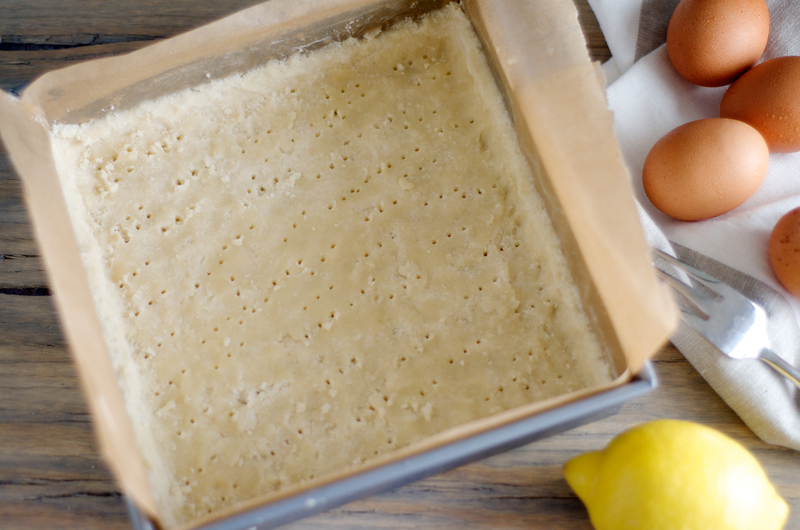 Lay parchment paper sheets in a criss-cross direction to create a paper sling. Lightly butter the exposed parts of the parchment or coat with a nonstick cooking spray. Note – I used butter and found it easier to lightly butter the pan first to keep the parchment from shifting on me. To make the crust, blend flour, sugar and salt together in the bowl of a food processor. Add butter and pulse until the mixture is powdery, but if firmly pinched will hold shape. Turn dough crumbs into the prepared backing pan; wipe bowl and blade of food processor down with paper towel and set aside to use for the filling. Press dough evenly across the bottom and about 1/2 inch up the sides. Prick crust all over with a fork and make for 20 minutes, or until lightly browned. If any parts of the crust bubble up, just gently prick them again with a fork or toothpick. Remove crust from oven, set on a wire rack while preparing filling. Leave oven on. For the filling – cut your lemon in half and really inspect it – is the white pith thicker than 1/4 inch? 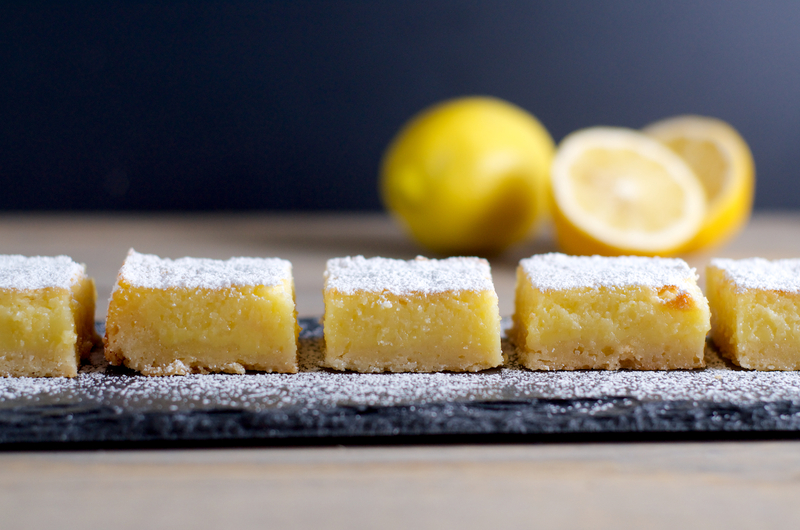 If it is, you’ll want to remove the pith from half of the lemon to ensure your finished bars aren’t too bitter. 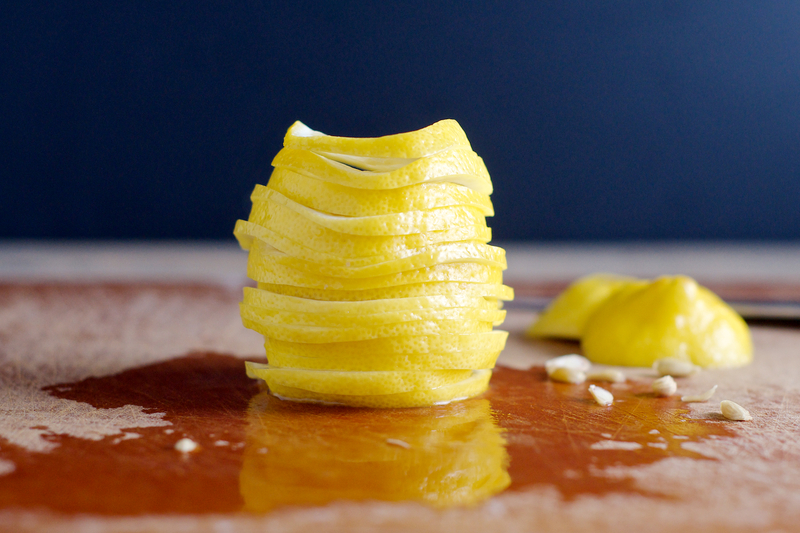 To do this, put one half of the lemon cut-side down on a cutting board and remove pith with a knife in downward cuts; discard the strips of pith and continue on. Cut the lemon into thin rings, removing and discarding any seeds. 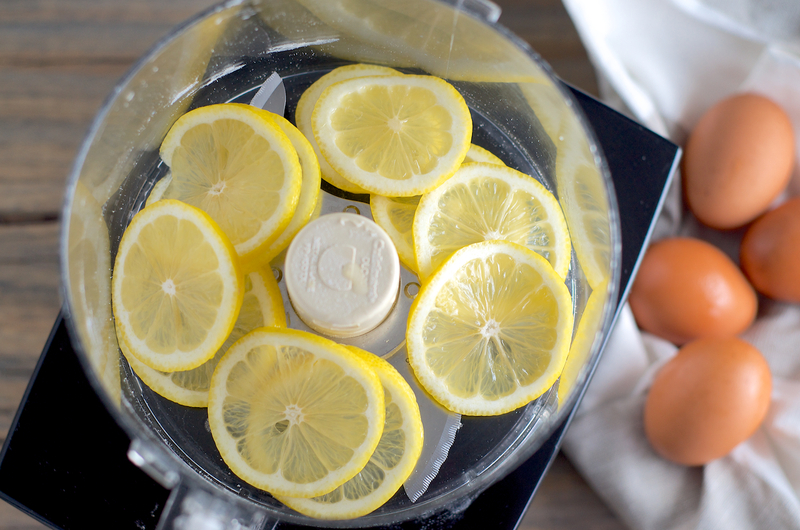 Toss lemon rounds into the bowl of your food processor and add sugar. Run the processor until lemon is thoroughly puréed, about 2 minutes. Add butter, and run again until mixture is smooth, scraping down the sides of the bowl as needed. Add in eggs, cornstarch and salt and pulse the machine in short bursts until the mixture is evenly combined. 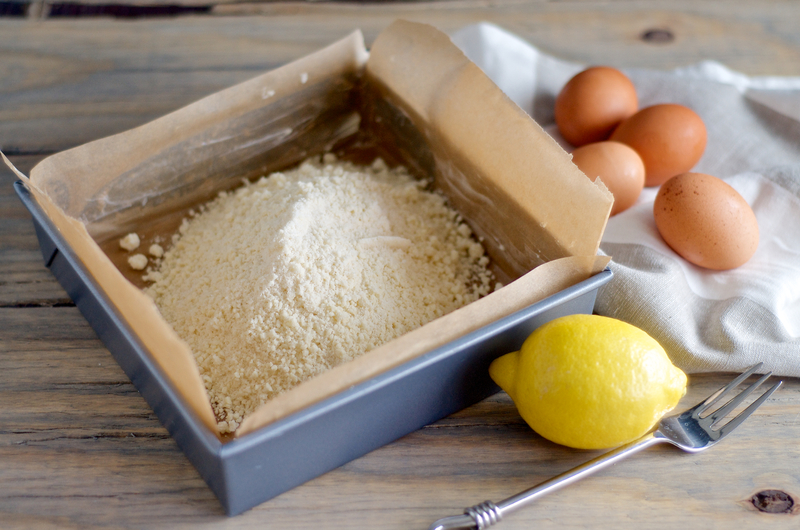 Pour lemon mixture over crust and bake for 35 to 40 minutes, or until the filling is set. I would start checking the bars at 30 minutes to make sure they aren’t browning too quickly and the filling has started to set. The filling is done when it only has a slight jiggle when gently bumped. Remove from oven to wire rack and cool completely. To remove from pan, gently run a knife around the outside of the pan to make sure the parchment isn’t stuck to the pan. Lift parchment sling out of the pan and transfer to a cutting board. Cut into 16 squares. 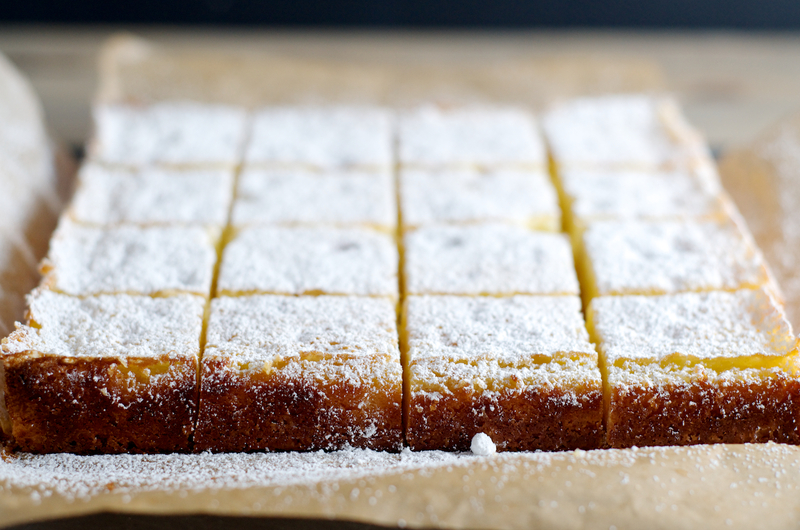 wow lemon bars like these take me back to my childhood! they look delicious, craving one right now! Now I know what to do with all the lemons on my lemon tree! Great recipe! It turned out exactly as it should have and it was a breeze to put together. It made many people happy. Going to attempt these tonight! They look wonderful. These took me forever to make, so many steps! But, they look delicious and smell good too! So i am looking forward to trying them! Will let u know. almost taste them now. They look awesome & beautiful. I’m 81 by the way. Thanks for sharing.